By John Sheehan on November 15, 2013 . Six months ago we launched Runscope with the goal of making debugging API calls as easy as debugging any other line of code. Thousands of web and mobile app developers have used our debugging tools to capture over 25 million API, webhook and backend service calls so far. That’s a lot of API calls! I'm terrified to make changes to the backend service that power our apps. Today we want to eliminate that fear. 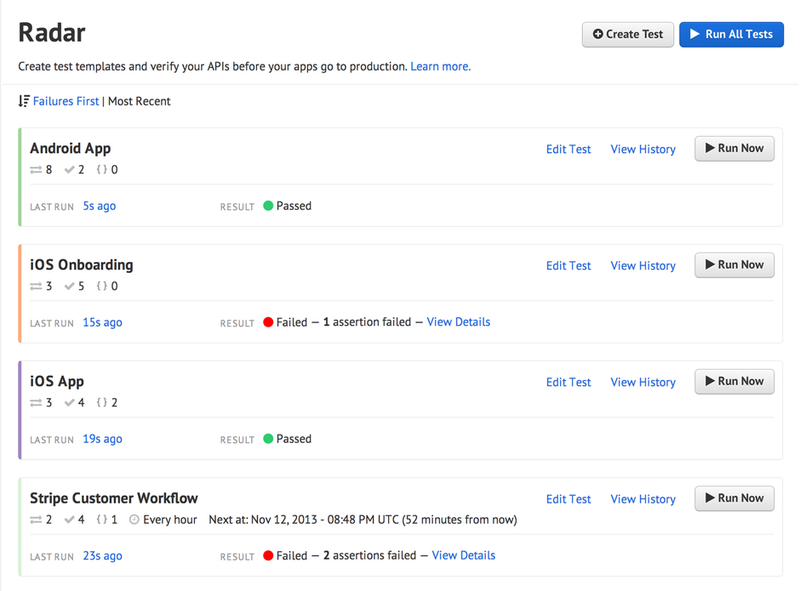 Today we’re introducing Runscope Radar: automated backend service testing and API monitoring for app developers. With Runscope Radar you can build tests that verify your services are returning expected data and receive notifications when things go wrong. Tests are easy to create and can be run every time you commit new code, or on a schedule in the background as frequently as every minute. All tests are run from Runscope’s high-availability, distributed infrastructure saving you the time and effort of setting up dedicated API monitoring and testing machines. Runscope Radar tests are groups of HTTP requests executed sequentially with each request defining expected outputs (assertions) and data extractions to use in subsequent requests (variables). Using requests captured via Runscope URLs allows you to quickly build tests with a high degree of fidelity with real calls. The real power of Runscope Radar is in assertions and variables. Assertions can check that a response contains an expected status code, HTTP header value or data (JSON, XML or text) value. 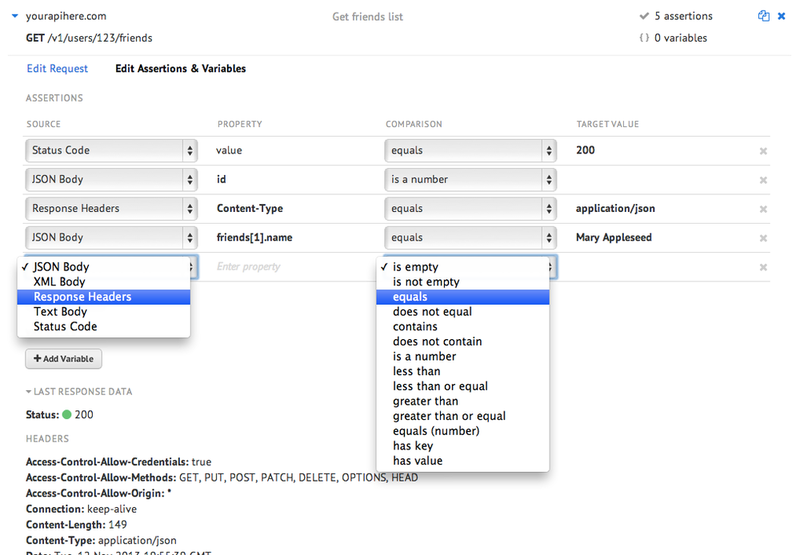 Variables allow you to pull data from one response to use in subsequent requests. Variables enable testing workflows that require multiple API calls that return unique data each time they’re called. The Developer Guide has complete details about the capabilities of Runscope Radar to help you get started. 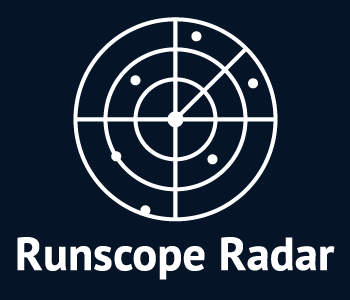 Runscope Radar is available today to all new and existing customers. If you’re new to Runscope, sign up for your free account. All new accounts start with a 30-day Team Preview Plan giving you complete access to the entire set of tools without any obligations or commitments. No credit card is required to get started. As we like to say, “Everything is going to be 200 OK.” With Runscope Radar, you’ll be certain that’s the case.